Scanning large objects may take a long time. Sometimes, only a smaller area of a disk needs to be scanned or searched for files. Such area is called a region . A region can be created on any object in the R‑Studio 's Drives panel. 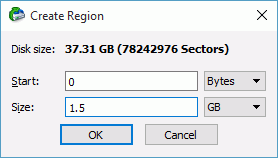 Created regions can be deleted or their size can be changed. Note: R‑Studio does not create anything real on the disk. Regions are virtual objects that do not affect actual data on the disk. * Right-click the Region on the R‑Studio Drives panel, select Edit on the shortcut menu, and enter a new size on the Edit Region dialog box.